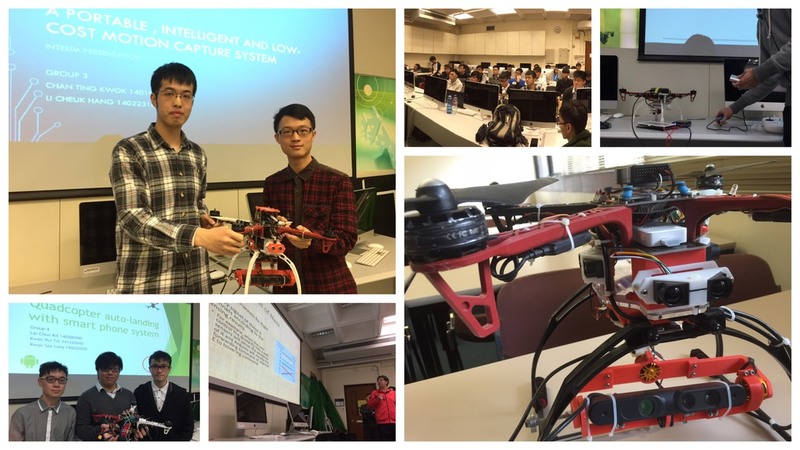 A group of 21 final-year students in EIE spent 9 months in an experimental learning-community based project in which they learned to design and construct drones that performed intriguing functions. Students began from scratch, setting their objectives, finding the right materials and components, identifying the most appropriate approaches, designing the machines and developing softwares, and eventually getting their drones built and tested. The learning community, formed by students themselves, encourages discussions and exchanges of ideas and information, mostly via smartphone group-chatting, complemented by regular face-to-face meetings and presentations of ideas. In the group chat, they shared not only technical information, but also their difficulties as well as exciting test news. The group underwent a steep learning curve at the early phase, and rapidly became technically competent and knowledgeable in the use of appropriate techniques and materials to achieve their objectives. External positioning systems are disallowed. This is unlike most demos we saw on YouTube where infrared or RF positioning system is used to track every object’s position. Students have to resort to sensors and on-board computation in order to develop intelligent functions that avoid obstacles, navigate, find targets, land on specific locations, etc. Constrained by limited resource, students have to figure out ways to achieve cost-effective designs using low-cost controllers like arduino, raspberry pi, and at most a compute stick. 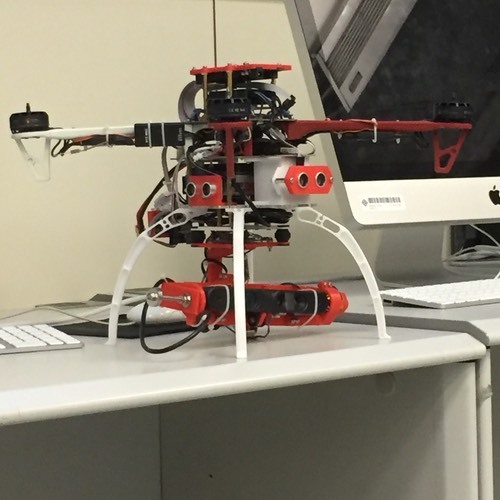 One group chose to implement all control on an Android phone to be mounted on the drone. Mechanical parts were custom-designed to fit their purposes and produced by a 3D printer. Two or three students teamed up as a subgroup to come up with one innovative idea, develop their design strategy and implementation details, and eventually produce a flying drone that fulfills the intended innovative idea. Update meetings of the entire group were held about once a month, and each subgroup reported their difficulties and progresses. At the end of the project, we saw flying drones that, equipped with sensors but without the use of any positioning system, navigate on their own like a human, avoid obstacles, catch a throwing object, find their way to a landing platform, land automatically, and even go through an automatic procedure to swap batteries, all done without human intervention. CLICK ON EACH TEAM (LEFT COLUMN) TO SEE VIDEO DEMOS.